Forza Horizon 4, which is taking a road trip to the UK, was available to download on the Windows Store over the weekend, at least for some people, despite being 4 months away from release. Unfortunately for those able to download it early, they weren’t able to do anything with their new game. The Forza Twitter account mentioned the unexpected early download yesterday, admitting that it was unintended and that the full game will download automatically when it’s released. Redditor daten-shi was one of the people able to preload Forza Horizon 4. They were not able to open any of the files because they were encrypted, and because the game was preloaded rather than fully downloaded, they were not able to play. 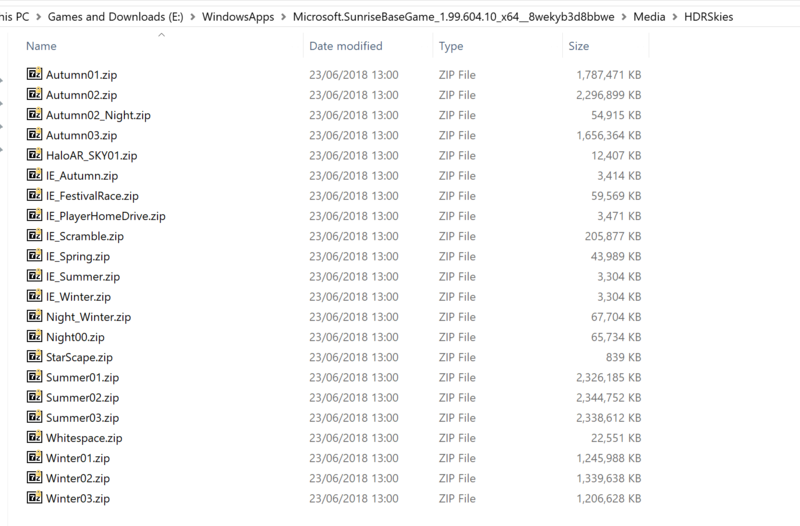 A list of cars was released, however, along with a screenshot of a folder containing sky assets, split up into seasons. You’ll be able to download Forza Horizon 4 properly when it launches on October 11. In the meantime, take a look at our Forza Horizon 4 preview from E3.